Today Slideshare has just launched an HTML5 version of it’s site, which like recent makeovers at LinkedIn and Pandora allows for a a much better experience on mobile devices. 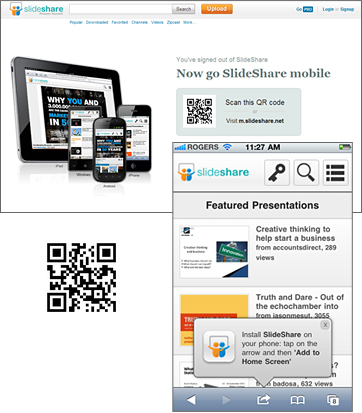 To connect Slideshare users directly to the relaunched mobile site, they’ve placed a QR code on their home page. It’s an excellent example of using a QR Code in a simple, straightforward way to connect the website to a mobile experience. When you arrive on the Slideshare mobile site a small unobtrusive popup appears at the bottom of the screen promoting you to “Install Slideshare on your phone, tap on the arrow and then Add to Home Screen”. Simple, straightforward and it all makes sense. When you are connecting users to mobile content it doesn’t matter whether you are using RFID, NFC, QR Codes, SMS or asking someone to type in a URL, the experience should be seamless for the user. I experience far too many examples in which I arrive at a mobile ‘UN-friendly’ site, and am left on my own to figure out what to do next.